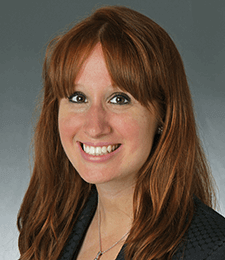 Lauren Glynn is an associate attorney with over eight years of experience as a trial attorney. Lauren concentrates her practice on automobile negligence defense, uninsured/underinsured motorist claims, and law enforcement defense. Lauren handles cases through all phases of litigation, from pre-suit to the arbitration or trial level. She has successfully obtained defense verdicts in third-party automobile, as well as first-party uninsured/underinsured motor vehicle cases. Prior to joining Goldberg, Miller, & Rubin, Lauren was an Assistant District Attorney at the Philadelphia District Attorney’s Office. While an ADA, she was in the Major Trials division where she prosecuted hundreds of violent crimes. Lauren tried hundreds of cases at the jury and bench trial level, including attempted murders of multiple Philadelphia police officers. She was also responsible for the investigation and presentation of numerous cases before Philadelphia’s Grand Jury, many of which received notoriety throughout the media. While in law school, Lauren was the business editor of Villanova Law School’s Environmental Law Journal and was a teaching assistant in the Law School’s legal writing department. She was awarded the Environmental Law Journal’s Excellence Award. When she is not practicing law, Lauren enjoys spending time with her husband, young daughter, and their rescue dog, Patrick. She is also passionate about health and fitness, frequently practices yoga and barre, and is an avid runner. She promotes wellness at GMR by organizing the firm’s fitness classes and running teams. Lauren participates in multiple charity runs each year that benefit families of law enforcement and cancer research. Defense verdict in a case with two plaintiffs that claimed that the defendant struck their parked car while they were both inside. Fact finding for the defendant since the plaintiffs did not meet their burden of proving that the defendant was liable for the accident. Defense verdict on damages in a case where the plaintiff alleged that a car accident causes multiple disc herniations. The plaintiff testified that she could not engage in any physical exercise after the accident. Fact finder determined that plaintiff did not breach the limited tort threshold.